In 1893, the US went through a serious depression, prompting widespread wage cuts and layoffs, which provoked a nationwide strike of miners. But these cuts extended far beyond the miners. An extreme example of the prevalent wage cuts occurred at the works of the Pullman Palace Car Company at Pullman, Illinois. The entire town - land, houses, stores, churches, and all-was owned by George Pullman. The first major event in which the A.R.U. was involved was a strike on the Great Northern Railroad, controlled by James J. Hill. Three times within a year the Great Northern had cut wages; three times the officers of the railroad brotherhoods had recommended that the men accept the cuts.4 Disgusted, a number of the men had joined the A.R.U. Under its rules - in contrast to those of the brotherhoods - a strike could be called by a majority of members on the railroad line involved. After the third wage cut, the A.R.U. members on the Great Northern declared a strike - although the A.R.U. was so new that not a single lodge had as yet been organized.5 The strike was supported not only by A.R. U. members, but by a great many other workers, including even the rank and file of the railroad brotherhoods. Even though brotherhood officials helped the company recruit strikebreakers to run the trains, the strike stopped all freight traffic on the line without recourse to blockade. Within little more than two weeks, the company was forced to accept an arbitration decision that was practically a complete victory for the workers. Within a year, the A.R.U. had 150,000 members, more than all the old brotherhoods together and only 25,000 fewer than the entire A.F.L.7 The new spirit of unity that imbued the railroad workers was revealed when the auditing clerks on one Western railroad wanted to organize, but were told by the company that any clerk joining the A.R. U. would be fired on the spot. The switchmen called on the manager and warned him not to threaten the clerks. "During a grave depression, when unemployed men stood on every street corner, such action seemed suicidal, but the switchmen made it stick, and for the first time a railroad office was filled with union men. "8 This spirit was what made possible the great Pullman boycott of 1894. The leadership of the union did everything possible to avoid a sympathetic strike. But when Pullman refused arbitration, saying there was "nothing to arbitrate,"12 and even to arbitrate whether there was anything to arbitrate, a committee of the A.R.U. convention urged that a boycott of Pullman cars be instituted. When the delegates wired home for instructions they found sentiment overwhelmingly in favor of the plan, and they voted unanimously to apply it. The boycott began on June 26th, 1894, when switchmen on a number of lines out of Chicago refused to switch Pullman cars. They were instantly fired, leading other workers on the lines to walk off in protest. Two days later, four or five Chicago railroads were stopped, with 18,000 men on strike. This was what Debs and the other A.R. 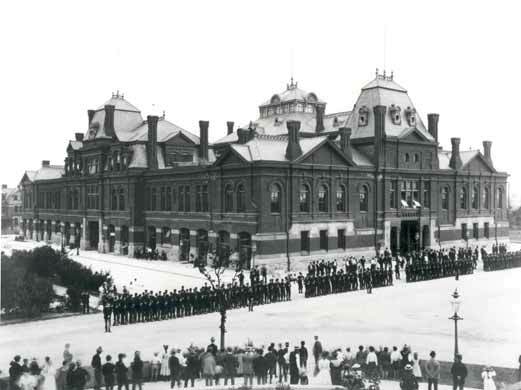 U. officials had expected; but they were greatly surprised as committees and groups of railroad workers from all over started appearing at the strike headquarters, announcing that their local unions had decided to strike in support of the Pullman workers.21 Soon virtually all twenty-six roads out of Chicago were paralyzed, and all transcontinental lines except the Great Northern - which carried no Pullman cars - were stopped. The struggle extended to twenty-seven states and territories. An estimated 260,000 railroad workers, nearly half of them not members of the A.R. U., joined the strike; Bradstreet's estimated that 500,000 were out of work because of the strike. Direction of the action moved on two levels. The A.R.U. convention had left the conduct of the strike in charge of its President Eugene Debs and its executive board. They rapidly set up a strike headquarters and threw themselves wholeheartedly into the strike in Chicago. These officials articulated the strikers' position, formulated aims, counselled non-violence, held daily mass meetings in Chicago, and sent out hundreds of telegrams a day encouraging the strikers. Operational control, however, rested in the strike committees that sprang up within each body of strikers. As Debs explained it, "The committees came from all yards and from all roads to confer with us. The switchmen, for instance, would send a committee to us, and we would authorize that committee to act for that yard or for that road, and that committee would then go to that yard and take charge of the affairs. "24 The A.R.U. officials consulted daily with these committees in shaping strike decisions. The committees also served in part to contain the strike within the limits set by the leadership, although this was by no means always the case; for example, when the Mobile and Ohio Railroad offered not to run Pullman cars, the A.R.U. advised the workers there to call off their strike, but they refused because they felt it would weaken the unity of the strike.25 This informal structure of strike committees allowed the coordination of the strike over a vast area of the country despite the lack of organized preparations. They were not composed of railroad workers, but of the most depressed part of the working class - immigrants, unemployed, unskilled. Next day the crowds grew, throwing switches, changing signal lights, blocking tracks with toppled boxcars. The largest crowd, numbering 10,000, started at the stockyards and moved slowly eastward all day along the Rock Island Line. The general sentiment was caught by a crowd that marched through railroad yards calling out workers, yelling that it was a "fight between labor and capital, and they must come out. "42 That night a great fire broke out, destroying seven structures at the World's Columbian Exposition, while at many other points railroad cars were fired. In California, public hostility toward the railroad monopolies was so great that the special Federal Attorney at Los Angeles warned Olney that he believed open rebellion an imminent possibility.45 Five companies of California militia assembled at their armory and declared their sympathy for the strike. Troops were ordered into Los Angeles following a coded report from the U.S. Attorney that heavily-armed strike sympathizers were pouring into town, and that in enforcing the injunction the U.S. government might encounter resistance from 5,000 armed men.46 The strike was finally broken in the Los Angeles vicinity by putting a detachment of troops on each train. At the last moment, the strike was almost given a reprieve by the workers of Chicago. They supported the strikers passionately. Newsboys, for example, dropped newspapers which opposed the boycott into the sewers.56 On June 30th, the Trades and Labor Assembly had pledged the strength of its 150,000 members in support of the strike. It sent a committee to tell the A.R.U. that, if necessary, every union member in Chicago would strike in sympathy, but Debs at that point considered the idea too extreme. How close at hand was a general strike? A number of locals in Chicago had already struck, and the Trades and Labor Assembly had come out for the idea. The Briggs House Conference statement said, "While we may not have the power to order a strike of the working people of our country, we are fully aware that a recommendation from this conference to them to lay down their tools of labor would largely influence the members of our affiliated organizations. "61 This would seem to be borne out by Gompers' testimony that "from St. Louis and various places throughout Missouri, Ohio, and Colorado, I was in receipt of telegrams that they had resolved to await the word that the A.F.L. conference would give as to determining their action. "62 Instead of calling for such support, however, the Briggs House statement urged "that all connected with the A.F.L. now out on sympathetic strike should return to work, and those who contemplate going out on sympathetic strike are advised to remain at their usual vocations. "63 Gompers agreed that had the executive board of the A.F.L. called a strike even in its advisory capacity, its members would have struck,64 and that the strike thereupon "would have spread to a greater or lesser extent over the whole country. "65 Many coal miners were still on strike, and more workers joined strikes in 1894 than any previous year. Given the stormy atmosphere of the time, Gompers' judgment seems sound. The real issue of the strike of course had not been simply the wages of the workers at Pullman. George Pullman defined the issue as "the principle that a man should have the right to manage his own property. "66 The secret minutes of the General Managers' Association suggested that the question was whether the railroads would "determine for themselves" what cars they would or would not handle on their lines.67 Or, as Vice-President George Howard of the A.R.U. put it, "I always contended that the men had a right to handle or not handle anything they pleased," whereas the company announced publicly that "they would haul such cars as they chose regardless of what the delegates to the A.R.U. convention might say, or what their own employees might say. "68 The real issue was the issue of power; it was understood that this in turn would determine the other questions of wages, working conditions, and the like. Excerpted from Brecher's excellent book, Strike! Lightly edited by libcom in order to make sense as a stand-alone text. 1. W.H. Carwardine, The Pullman Strike (Chicago: Charles H. Kerr and Co., 1894), p. 69, cited in Yellin, p. 104. 2. Chicago Times, June 13, 1894, p. 2, cited in Almont Lindsey, The Pullman Strike (Chicago: University of Chicago Press, Phoenix Books Ed., 1964). p. 127..
3. U.S. Strike Commission Report, Senate Exec. Doc. No.7 53d Cong., 3d Sess. (Wash.: GPO, 1895), submitted to Pres. Cleveland on Nov. 14, 1894, p.62. 4. Gerald G. Eggert, Railroad Labor Disputes, The Beginnings of Federal Strike Policy (Ann Arbor: University of Michigan Press, 1967), p. 147. 5. Ray Ginger, The Vending Cross, A Biography of Eugene Victor Debs (New Brunswick: Rutgers University Press, 1949p, p. 97. 10. Chicago Times, May 13, 1894, p. 20, cited in Lindsey, p. 126. 13. U.S. Strike Commission Report, p. 135. 22. New York Times, June 29, 1894, cited in Lindsey, p. 203. 23. Chicago Tribune, July 3, 1894. 24. U.S. Strike Commission Report, p. 140. 25. Ibid.. p. 28; Lindsey, p. 240. 26. Eugene Debs, in Public Opinion, July 5, 1894, cited in Yellin, pp. 115-6. 28. Eugene V. Debs, Writings and Speeches of Eugene Victor Debs, (N.Y.: Hermitage Press, 1948), p. 45. 29. John Egan, in Inter Ocean, July 3, 1894, p. 3, cited in Lindsey, p. 144. 31. John Egan, in Inter Ocpan, . July 1894, p. 3, cited in Lindsey, p. 144. 32. Olney to E. Walker, June 30, 1894, Appendix to the. . . Report of the Attorney General. . . 1896, p. 60, cited in Lindsey, p. 150. 33. Grover Cleveland, The Government in the Chicago Strike of 1894 (Princeton' Princeton University Press, 1913), p. 232. 35. John Swinton, Striking for Life (N.Y.: Western W. Wilson, 1894), p. 92. 36. Chicago Times, July 3, 1894, v. 1, cited in Lindsey, p. 164. 37. Arnold to Olney, July 3, 1894, in Chicago Strike Correspondénce, p. 66, cited in Eggert, pp. 170-1. 38. Olney, quoted in Eggert, p. 172. 39. Strike Commission Report, p. 39. 40. New York Times, July 5, 1894, cited in Lindsey, p. 175. 42. U.S. Strike Commission Report, p. 214-5. 43. New York Times, Aug. 16, 1902, cited in Yellin, p. 122. 44. Waite, in Inter Ocean, July 7, 1894, cited in Lindsey, p. 168. 49. Hugh D. Graham and Ted R. Gurr, The History of Violence in America (N.Y.:Bantam Books, 1969), p. 298. 50. Annual Report of the Secretary of War for the Year 1894, Vol. I (Wash.: GPO, 1894), p. 109, cited in Lindsey, p. 214. 51. Bradstreet's, July 28,1894, p. 467, cited in Yellin, p. 130. 52. Strike Commission Report, p. xlii. 54. Terre Haute Evening Gadzette, July 19,1894, cited in Yellin, p.123. 55. St.John, testimony in U.S. Strike Commission Report, p.117. 57. New York Times, July 12, 1894, cited in Lindsey, p. 225. 58. "Proceedings of Briggs Conference," p. 133, cited in Lindsey, p. 228. 59. Chicago Tribune, July 14, 1894, cited in Ginger, p. 150. 60. U.S. Strike Commission Report, p. xxviii. 61. "Proceedings of Briggs Conference," p.
62. U. S. Strike Commission Report, p. 190. 67. General Managers Association, Minutes of Meetings (Chicago, 1894), p. 94, cited in Eggert, p. 156. 68. U.S. Strike Commission Report, pp. 9, 11.